Among the elements necessary for a well-functioning school district, central office staff is often overlooked. However, a functioning central office is vital. 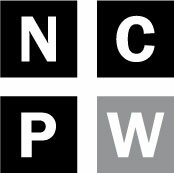 These professionals ensure that money is spent in accordance with the law, provide technical assistance to low-performing schools, comply with the numerous data and reporting requirements imposed by state lawmakers, implement state programs, recruit and hire school staff, develop school assignment and busing plans, and otherwise manage a school district’s complicated logistics. Both the House and Senate budget proposals include draconian cuts to funding for school districts’ central office operations. The proposed cuts in the 2017 budget come on the heels of a number of post-Recession budget cuts. These cuts fall disproportionately on poor, rural districts that lack the local funding base necessary to replace the revenue eliminated by state cuts. And of course, the cuts ignore the simple truth that if we want our school districts to succeed, they need competent administrators. The central office allotment was created in 1995 when S.L. 1995-450 consolidated nine allotments for various, specific positions into one allotment for “central office administration.” Following consolidation, the central office allotment was funded at approximately $84 million. The original allotment formula provided a base level of funding to each school district because many central office costs are fixed costs. That is, every district needs a superintendent, a finance officer, curriculum supervisors, and human resource professionals. The formula then provided additional funding based on the number of students in a district, with smaller districts receiving a larger per-student appropriation. Since its establishment, the central office allotment has been a frequent target of budget cuts. The allotment has been reduced in each of the 2001-02, 2002-03, 2003-04, 2009-10, 2010-11, 2011-12, 2012-13, 2014-15, and 2016-17 fiscal years. Due to insufficient funding, the original allotment formula has been abandoned. The General Assembly is proposing slashing funding even deeper in the upcoming biennium. The House proposes cutting the FY 2017-18 allotment by $5 million, and the FY 2018-19 allotment by $10 million. The Senate goes $5 million deeper each year, proposing a $10 million cut in FY 2017-18 and a $15 million cut in FY 2018-19. As shown above, if the Senate position holds, the central office allotment will be 34 percent below its pre-Recession level in FY 2018-19 and below the nominal level originally provided more than two decades ago. 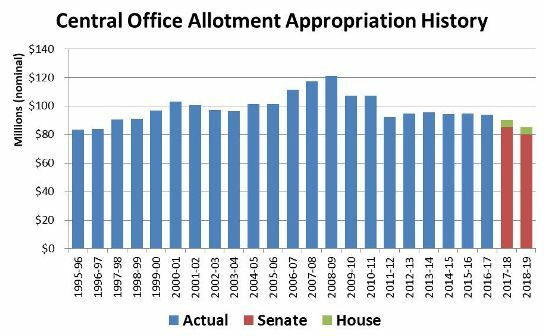 In inflation-adjusted terms, the Senate’s FY 2018-19 appropriation would be a whopping 40 percent below the FY 1995-96 level. Of course, demands on central office staff have increased over the years. Districts have been charged with implementing additional programs while providing more and more data and informational reports to policymakers in Raleigh. As a result, these budget cuts have not actually reduced school districts’ need to spend on central office personnel. Instead, the years of central office budget cuts have created an unfunded mandate, requiring school districts to use local funds to make up for the state funding shortfall. These spending patterns belie the notion that school districts can operate without administration. 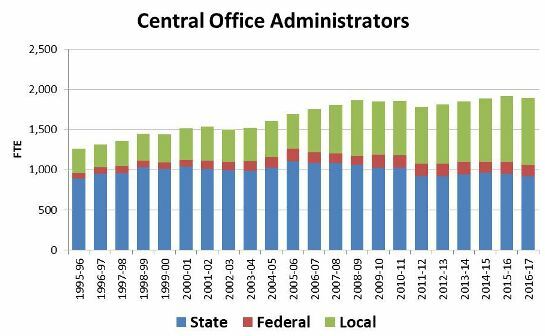 Since the inception of the central office allotment, the number of state-funded central office administrators has essentially been flat, the number of federally-funded central office administrators has doubled, and the number of locally-funded central office administrators has nearly tripled. Unlike the General Assembly, school districts clearly understand the simple truth that schools require adequate management. Of course, not all school districts have equal capacity to manage this unfunded mandate. Analysis from the Public School Forum of North Carolina indicates that disparities in local spending have been increasing in recent years, mostly as a result of the variation in property wealth across the state. As a result, some districts still have the capacity to effectively implement new programs or provide support to help turnaround low-performing schools, while other districts struggle to simply keep their schools running. For example, Tyrell County’s central office staff is limited to just five state-funded employees. By contrast, Charlotte-Mecklenburg Schools benefit their state-funded central office staff with 69 locally-funded and 17 federally-funded central office administrators. The General Assembly’s antipathy towards administrators extends to the Department of Public Instruction. Since FY 2008-09, DPI has lost 197 state-paid positions — about 31 percent of its workforce. 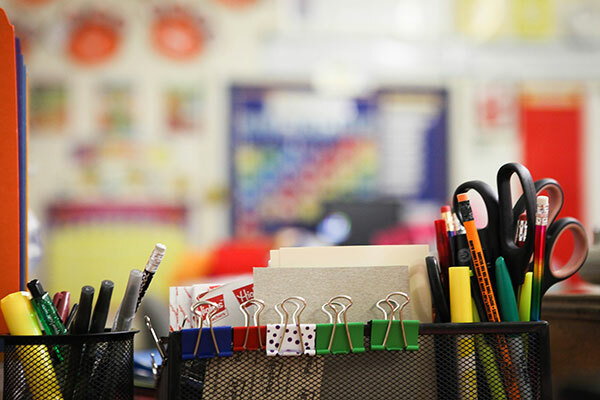 These cuts have hindered the agency’s ability to oversee $12.7 billion in spending, provide technical support to districts, and to assist low-performing schools. Yet the Senate has proposed gashing DPI’s budget by an additional 25 percent, while the House proposal would “only” cut the agency by about 4 percent. The current General Assembly leadership has been in charge for nearly seven years. If they bothered to learn how public schools work, they would understand that slashing administrative budgets while increasing demands is a nonsensical strategy. Who will complete the eight new reports mandated by the Senate budget, or the whopping 22 new reports proposed by the House? Who will carry out new, unfunded – yet important – programs like the House’s Youth Suicide Awareness and Prevention program? If General Assembly leaders are unhappy with the management of North Carolina’s public schools, they owe it to students and educators to put forth serious plans for reform. Mere budget cuts and wishful thinking, however, are a recipe for failure.